The best ghost tour ever !! Highly recommended!! Many different stories told during the tour! Freaked me out big time!!! Probably one of my favorite things we did while in Charleston. Great history stories! I would suggest taking a carriage ride as well if you love history! Our tour guide was spectacular! Seriously hair raising stories. He was an excellent story teller. You could tell he wasn't just a tour guide hired to tell stories. Ghost stories were his thing! Super knowledgeable. Highly recommend! My family spent the weekend in Charleston, and one of the things my teenage son really wanted to do was a ghost tour. While we were driving home talking about our weekend, we agreed this was definitely a highlight. My teenage son LOVED it, I also have an easily-spooked 11 year old who enjoyed it, but did get a big spooked by a few of the stories. I enjoyed Mike's storytelling style and would definitely recommend this tour. Thanks!! "Best Haunted Tour in Charleston"
We took the haunted tour with Mike Brown and we were so happy we did! His stories were interesting and one of the best parts was the pictures had had to go along with the stories. Also, his personal experiences and stories were so interesting and put a real spin on each of the stops. Mike was an awesome guide with great insider knowledge and I would love to take another tour with him. We actually took a second ghost tour with a big company and really wish we had just stuck with Mike. He is absolutely a must-see tour guide! My husband and I were in Charleston last weekend and had a tour hosted by Mike Brown. His stories combined both historical and spooky events and was very well done! He also hosts a cool podcast; highly recommend! This tour was a great mix of Charleston history and spooky occurrences. I loved his story telling. I would have enjoyed visiting more places. I would recommend him to friends. Mike Brown was a great, informative tour guide, and you can tell that he is passionate about his craft. His stories were information, spooky, and based in history. I learned a lot and was able to see Charleston from a different angle, which was fun! We had Mike Brown as our guide and he was awesome. I was sufficiently creeped out which is the way it should be on a ghost tour. The stories told were interesting and made my want to learn more about the history of Charleston. Loved it. This chilling and fascinating ghost tour was spooky enough to feel frightened, but not so much as to be traumatizing. The stories our tour guide told were so intriguing and he has an excellent story-telling voice, tone, and speed. Can't miss! Mike Brown was our tour guide for a walking ghost tour of Charleston and did a great job! My wife and I were lucky enough to be the only sign ups for the night, so it was great having that one on one experience to ask questions and get as much info as we could take in. We went to some very cool spots and Mike was extremely knowledgeable and kept our interest the entire tour. I would 100% recommend this tour to anyone going to Charleston interested in a ghost tour! Mike Brown is as educated as he is interested in the topics of his tours. As participants of the Ghost Tour, we were blown away and chilled to the bone with the stories told of the ghosts haunting the homes and buildings of historic Charleston. We will be checking out his podcast, Pleasing Terrors, as well as other tours he has to offer in this historic city. A+ in our books. We enjoyed the ghost tour. he was very knowledge of the area and history of charleston. made sure that everyone was involved. Went with my parents, husband and 3 teenage girls. we all had a good time. would recommend. My husband and I went on the 9:30 ghost tour. Our guide seemed very knowledgeable and a great storyteller. He seemed to have researched the stories he told, rather than just told the same stories he has heard, which I really appreciated. He also showed pictures at each place that added to the spookiness. I enjoy doing different types of tours in historical cities, and this was one of the best I have been on! This was our first time in Charleston and thought a walking tour would be a good way to tour the city. Joyce, the tour guide was knowledgeable, enthusiastic and punctual. She gave us photo tips which were greatly appreciated. We would recommend this tour to anyone. "Our trip to Charleston SC"
The guide was very interesting. He led a small group around the city to different locations and described an unusual event that occurred there. I am not going to give anything away but the information and presentation made believing in ghosts not so unusual. The first ghost tour we've been on where my daughter and I both had that tingling feeling on the back of our necks! I believe it helped that we had done a walking tour and had visited a few of the places prior to the tour. Knowing that we had been in these places and now he's telling truly eerie stores about it added to our experience immensely so I highly recommend that. My review is later than I normally would post it. We did this in early August and chose the latest tour to make sure it was dark and no little ones so that there wouldn't need to do much editing (not that he does that anyway, but we just wanted as scary an experience as we could make it). Well, we did have some little ones on our tour which leads me to two things - Mike handled this well (I'm sure he's completely used to it), but they were distracting to us. Funny thing is that I have teens and all of us were annoyed. It may have had something to do with the gum smacking. I wouldn't normally complain about kids(I have them - just older now), but this was late and my kids would have been in bed at this time of day at that age. Well, despite that, this was our favorite ghost tour ever. Wish it had been longer, but maybe that's because it flew by because we were having such a good time. "Fun and interesting ghost tour"
I booked the 7:30pm Sunday night tour, along with my two teenaged daughters. Mike, our tour guide, provided excellent history along with creepy stories from in and around downtown Charleston. The tickets were easily booked online, and very clear directions were provided for meeting up with the tour. It was a super fun way to spend an evening. "Ghost walk with Mike Brown"
We took the 7:30 tour with Mike and it was a great tour. His knowledge of Charleston and ghost/history is unmatched! Can't wait to get the photos developed! "Great storytelling and very interesting"
I went with friends. I have been on another night tour of the graveyards, but this was different. I like that if you book a tour with Mike, Mike is your guide, not a random employee. Mike is a great storyteller and had photos and context for each story. It is obvious he enjoys what he does. This is not a tour about a bunch of historical fact, its some great stories about a few places. Good fun! "Old charleston Walking history tour"
I had a thoroughly interesting experience on my tour. Ruth was knowledgeable and top notch tour guide. Tons of info presented in an interesting and professional manner. Would totally recommend. "Fantastic tour with great stories"
Mike Brown is great storyteller and also had many pictures to show us on his evening ghost tour. He even kept things interesting by telling a story as it's been known in the past only to surprise us with a twist in the story after new information was discovered! He also does a free podcast which includes stories from Charleston as well as stories from other places too. Mike Brown, the tour guide, is not just doing a job--he's into ghosts! He really investigates his subject and obviously loves it. He brought us around to several haunts and told us about them. I had goosebumps many times! His photos of ghosts at these haunted locations really enhanced the experience. I'd highly recommend this tour--it was creep but not too scary. Mike Brown knows how to tell a great ghost story! My teenage son and I went on his ghost tour and really enjoyed it. We learned new things about Charleston and got to see a side of it we never knew. The stories were backed up with solid historical research and told in a scary (but not too scary way). I would highly recommend doing this tour and then following it up with Mike's podcast (Charleston related episodes) - Pleasing Terrors. Amazing stories that bring together historical Charleston with supernatural Charleston. We took the 730 Saturday night tour and we're a bit skeptical, but highly recommend to anyone looking to learn something about the town while keeping an open mind..
We did the 7:30 pm ghost tour while we were in town on vacation. Mike Brown was our guide. Not only has he been doing tours for 19 yrs but he is so captivating and passionate about what he does... amazing time. I did the 7:30 p.m. Ghost Tour last night and had a wonderful time! Mike is super knowledgeable about Charleston and the walking tour was the perfect mix of spooky and historical. I highly recommend this tour! Had a great time walking around learning some of Charlestons creepy history. Would recommend. Michael Brown was awesome. My wife and I spent a very interesting and enjoyable couple of hours on this ghost tour recently. Mike, our guide, certainly knew his stuff and was very interesting, informative and a great storyteller. We thoroughly enjoyed ourselves and would highly recommend this tour. Very enjoyable and informative tour of Charleston history. Mr Stiles was very entertaining and knowledgeable. Learning how the Civil War played out in Charleston brought history alive. Mike does an awesome job! He did an excellent job of mixing history, local lore, and personal experience to provide a very engaging experience. He approaches his tour from a very grounded place, does not try to "convince" anyone, but takes the time to research the ghost reports and tries to figure out the untold historically-documented stories behind each tale. Mike also includes pictures on his tablet to show you what building looked like, photos of the people allegedly haunting the town, and photos that visitors have taken on his tours and sent to him. Very well incorporated into the tour, and never felt forced. He has also been doing this for forever, and really knows his stuff. My wife and I spent a couple of days between Christmas and New Year's Eve in Charleston (first time). We had toured on our own, but decided to book a guided tour in addition, it was well worth it. The group was just us and another couple, very pleasant. Our guide Dennis presented a great mix of very interesting and also entertaining background on all aspects imaginable: history, architecture, politics, social affairs, ... He answered any imaginable question knowledgeable, and in great detailed. I can absolutely recommend this tour. We choose the walking tour over a horse carriage tour and that was definitely the right choice, we saw a lot, learned a lot, subjects were very flexible, and the pace adjustable - I would think that is a big advantage of walking compared to carriage. Goof job Dennis, Thank You. First time in Charleston, I learned a lot about the city and had a great time doing it. The guild Micheal Brown was very informative. 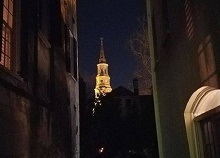 We learned that during the off season, Charleston is pretty sleepy by around 8:30, so we scheduled a ghost tour with Old Charleston Tours to have something fun to do after hours. We chose the 9:30, and luckily, it was still quite warm and very pleasant. Mike is a GREAT story teller, and makes every story sound like historical fact, whether or not you are a believer in the supernatural. It was also a cool way to learn some fun facts about Charleston that we didn't get on the carriage tour. Definitely recommend. Denny took time to get to know us so he could tailor the tour to fit our interests. We were impressed by his knowledge of local, state and national history that he presented in a charming way. It was our first day in Charleston, and we felt like this tour gave us a good grounding in the city and the important sites. We thoroughly enjoyed this personalized tour! My wife and I booked the 9:30 pm pleasing terrors ghost tour with Mike Brown. We had a long day and around time to leave I thought about blowing it off. My wife convinced me otherwise and we went. It was a perfect night for a ghost tour; cool with winds blowing. Mike was a master story teller who was convincing in his belief. The stories were intriguing and they made the trip. AT one point, my wife shouted out that there was a flickering light in a window (probably and faulty electrical problem -- or was it??). In any event, this was one of the highlights on the trip and I am glad I went. The guide was excellent! I honestly felt he believed in the ghosts he was talking about. I got the chills a couple of times. It was a fun evening. Hubby and I took four teenagers, ranging from 13 to 17. They all loved it! Enjoyed it more than a ghost tour we did last year in Savannah. Filled with interesting fun facts about Charleston's spooky past. Mike is an excellent story teller, really capturing his audience. Get a bottle of water before starting the tour. It's an hour and a half and you'll need it! Time flies though on the tour cause it is so very enjoyable. Highly recommend! We went on a 7:30 ghost tour with Mike Brown. His ghost stories were very entertaining, and I liked the way he kept connecting the personal accounts of ghosts with the history of the buildings and the area. Even our kids (11 and 15) enjoyed the tour. Our group was a manageable size, about 16, so we had no problem hearing Mike or seeing the pictures he displayed. Our adult family of 6 went on the 9:30 Ghost Tour. It was a great family activity and Mike was a great tour guide. I was expecting silly stuff but it was very interesting and informative. There were three of us that went on the 7:30 pm ghost tour led by Mike. He's a great tour guide and we really enjoyed the experience. It was an easy walk and Mike kept the pace just right, moving from place to place quickly but not hurriedly. The stories were on topic, relevant to the place we were at and interesting. Although it's ghost stories, they aren't over the top and they all come from personal experiences of people he's met. I would recommend taking some bug spray though as the no-seeums were out in force. I would take another tour with Mike anytime. We had a wonderful time on the tour last night. The stories were great. Mike did a fabulous job. He is a great storyteller. I would highly recommend to anyone who is a history buff. This was a nod to the desires of the girlfriend. Mike was engaging and very informative. I appreciated his approach and his research. I think the route was well thought out and well lit. She was happy, therefore I am very happy and appreciate the effort from Mike. This was such a great tour! Although it was probably the coldest night in Charleston, Mike's tour kept us on the tips of our toes with his fascinating ghost stories. What I liked was that not only was he knowledgeable about Charleston history, he also shared lots of stories about happenings on his tours, as well as stories his tour members have told him. All around such a fun thing to do in Charleston and thoroughly freaky. A must! I've been on at least a dozen ghost tours in six states. This is by far the best one yet! Mike Brown was the guide. He has a vast knowledge of the history of Charleston. He is funny and engaging, a truly gifted storyteller. The tour covers about a mile in an hour and a half and is an easy walk. You see some beautiful old buildings along the way. The stories are plausible and have some basis in fact. It is a great way to spend an evening. Our Old Charleston guide on the Halloween ghost tour was Mike and he was fantastic!! We walked along many interesting areas of Charleston. Not only did Mike do his own research but you could see he had a passion about this town! He shared some stories about his own encounters as well! This tour was historical but he brought in enough "scare" to make this one of the best Halloweens ever!! Mike Brown is a fabulous storyteller. My kids, aged 11 and 13, were thoroughly engaged the whole time. The historical tidbits were great. Definitely an excellent walking tour. We took the 9:30 pm ghost tour with our girls, ages 16 and 10 and were pleasantly surprised. I was a little leery prior to the tour, worrying that it might be cheesy or overly scary for our girls, but Mike was a very good guide and included some humor along with the stories of strange happenings. He really did a good job including factual information about Charleston history and explained that he researched the stories that he told as best he could, then retold them to us and it was up to us to draw our own conclusions. I was also pleasantly surprised at how safe I felt walking around town that late at night. There were tons of people out and about coming and going from restaurants and shows and we didn't see anything sketchy that made us fear for our safety. My kids loved this tour, we all loved seeing and hearing about "old" Charleston. We went back the next day to explore the graveyard where some of the ghost stories began. So fun! Took the 7:30pm ghost tour with Mike on 7/8/15. The 9:30pm tours I was hoping for were already sold out for the week. Decided to try this 7:30pm tour instead of one from a different group because of the positive reviews on Trip Advisor. We were not disappointed - our family really enjoyed the tour. Mike's ghost stories were interesting and his delivery is great! Got to learn some interesting Charleston history along the way. Really happy with our choice. Mike Brown conducted this tour and he is a phenomenal story teller. There were people of all ages on the tour and Mike has truly done his research to ferret out the "facts" or at least theories behind the history of each sightings. I appreciated the fact that we didn't go into any creepy, scary buildings and nothing jumped out at us! It's a good 90 minutes with one bathroom stop in a hotel. Very knowledgable guide gave us a wonderful ghost walk. There are lots of different companies that offer ghost tours in Charleston, but I can't recommend Old Charleston Walking Tours enough. My friend and I did a 9:30 PM tour with Mike Brown, and he was fantastic - not only is he a phenomenal storyteller, but I could tell that he had also done extensive research and really knew what he was talking about. By the end of the tour, we had learned a lot of interesting tidbits about Charleston history, got to see some really cool parts of downtown we had missed while exploring on our own, and - most importantly - were sufficiently spooked. Mike's tour was fantastic and we absolutely loved our experience! Michael Brown is a great guide and he really knows how to give you the creeps! Totally in a good way. :-). The stories of possible haunting a were very interesting and got all of our wheels turning. My tween and my teens sons were creeped out!They enjoyed the walk enough to be talking about it back at the hotel that night. We were happy with our tour, even in the rain. I purchased a groupon ticket to attend the ghost tour with my husband. Mike Brown the guide did an excellent job. He shared people's experiences & encounters with ghosts and then historical facts that back these events & occurrences. He also shared fun facts about the city which I would have never known. Very well organized & informative. I would go back with my family again without a groupon voucher! I've lived here my whole life, and so when some family friends came into town wanting a ghost tour and I decided to go with them, I honestly I wasn't expecting to have such a wonderful time. The way in which Mark Brown told the stories, his voice and pitch changes accompanied by vivid descriptions and spooky backdrops left you wanting even more as the tour came to an end. It really made me fall in love with downtown Charleston again, walking the old streets in the cool nights air, hearing about the past. I would definitely recommend anyone from a local to a tourist singing up with Mark and exploring Charleston's haunted side. Among the many ghost tour options we chose this one based on the various reviews and were most definitely not disappointed. The tour guide was very knowledgeable and had a great command of the audience’s attention. He knew the stories and history inside and out and was able to wrap all the tales together while even including some fun facts along the way. A member of our group had been on a different ghost tour the night before and said this one was 10x better. I would highly recommend this tour! Old Charleston Walking Tours guide Mike Brown provided an excellent ghost tour. Mike is very knowledgeable of Charleston haunts and history. He is a Charleston native and has been providing tours for many years. He has the perfect voice for telling creepy ghost stories. My favorite story was about the Charleston jail. We also stopped in front of a locked cemetery gate to hear a story. The next day when the gates were open we walked through the cemetery. It was overgrown and looked abandoned. Mike is happy to answer any questions you have throughout the tour. You won't be disappointed in this ghost tour. Thanks for a great tour! What a great adventure! Had a blast following our guide (I think his name was Mike) around Charleston. Very Intelligent and informed tour, And he had the perfect bold, somewhat creepy story-teller voice to go along with it! Great tour for the whole family. HIGHLY RECOMMEND. On our second trip to Charleston, my husband and I opted to try a Ghost Tour. I chose the 930pm starting time, figuring that there wouldn't be any small children, and it was apt to be scarier. Mike Brown, tour guide extraordinaire, was so interesting and made the tour lots of fun. His stories were filled with lots of history and were spot on informative. He piqued our interest in so many places, that my husband and I made sure to revisit some of them the next day on our own. Mike carries an IPAD and will add to the experience with photos, enlarged and passed around for all to see. A not to be missed experience! We did the haunted walking tour at 730 pm. Mike was a great storyteller and knew how to handle a large group. His voice was loud enough to hear, and he made sure that others could navigate around us. I also loved that had had pictures and connections to history Mike was able to provide. I would not recommend this tour for kids. The stories weren't too scary, but the one kid on our tour seemed pretty bored. His mother kept trying to stop picking up rocks and climbing on walls surrounding the cemeteries. We have been to South Carolina several times, however have not taking a walking tour before. We were amazed at the history of Old Charleston. Mike our tour guide was very knowledgeable. He answered our questions and very accommodating. This tour is well worth your time. You will not be disappointed. If your looking for a serious tour guide this is the tours to reserve. We took his ghost tour, and not only did he tell ghost tours , he back them up with historical information. He talked loudly for everyone to hear and was respectful to those that were walking on the side walk. You could tell he has a passion for the job. When we finished the tour, I was left hanging on for more information. I would definitely go with this company again.He didn't try to pressure you into believing, but left it up to your thinking. Mike Brown was our tour guide. Mike really gets into his presentation of the stories he tells. He walked us around Charleston to several different locations for almost 90 minutes and really did the stories justice by building the suspense. Mike is very knowledgeable and supports his claims with actual events or facts from research on the events/places. I would definitely recommend his tour to anyone! If you read ALL the reviews, he gets a 5 circle rating for a reason, he is worth it! Mike was born and raised in Charleston. His stories are all based on research, not just off the wall stories! I will never forget John and Lavinia Fisher, Zoe St. Amand of Sue Howard Hardy. Awesome stories, he enjoys questions and interaction, so speak up. Everyone agrees, when the tour is over, there is a sense of loss. Mike Brown could have a 4 hour tour and and it would end too soon! If you are looking for a great ghost tour, look no further! Mike Brown was our tour guide for the 7:30 p.m. tour on Wednesday, May 15th. He was an excellent guide who not only told us some of Charleston's creepier side, but he also talked about general history of the area. Ghost tales were connected with historical events seamlessly and the tour was a great blend of spooky and informative. Mike spoke in a loud, clear voice so that no one had to strain to hear him. Not only did we get a great tour, but we also got ideas for sight-seeing on the rest of our trip based off of some of the information that he shared with us. When the tour was over, I was left wanting to hear more stories! I highly recommend this tour. It was money well spent. Mike was our guide for the 9:30 pm tour on Wednesday, May 15. He is not only a great storyteller, i actually found myself believing it! The town in and of itself is a perfect setting for tales of the ghost of Lavinia Fisher, the first white woman hung in the state of South Carolina as well as a serial killer. Also, the story of Edgar Allan Poe visiting the grave of his love intereste Annabelle Lee Ravenel was intriguing. Will do again when we visit again! Thanks MIKE! Did a ghost tour with Mike on 5/13 and loved it! We chose Old Charleston Walking Tours because they were advertised to be pet friendly. They couldn't have been more accommodating of our lab. We enjoyed learning more about Charleston's history. Talking later, we agreed it was the best money we had spent during our trip in Charleston.